Knowing that 1 January 2011 brings with it an opportunity for change, I cannot help but reflect on life as it is today.﻿ It seems only natural to recognise that unaddressed anger is a real possibly. It is one feeling that I have always had difficulty with. As I endeavour to write from a positive perspective in order to lift myself and inspire others, I know it is time to be honest with myself. I am sure that deep seated anger does, in some way, contribute to my breast cancer! As my struggle with peripheral neuropathy in the lower extremities increases, and the degree of pain, including nerve and muscle damage, develops in my right hand, I have become increasingly frustrated with my inability to manage daily household chores. The isolation of rural living, medication and chronic pain all contribute to depression which, in turn, leads to lack of motivation. I now acknowledge that Femara is instrumental in causing the fatigue that makes life almost unbearable at times. I sometimes omit to take it and within 24 hours my sleep requirements become somewhat normal. The garden has become overgrown; pests are becoming a problem. Mealy bug, borers and scale are currently causing serious damage. Haydn is a great one for spraying Round Up to control the native couch. Fortunately, we have now learned that glysophate locks up trace elements and we have been able to add it, along with organic matter, to improve the soil. Haydn loves the tractor and works tirelessly on pasture improvement but is not interested in maintaining our shrubs. As a result, they are becoming overgrown. The bush garden in memory of Jeremy has never been finished. I am wondering if the time will come that I am once again able to drive myself? If not, then it seems fair to say that life at the farm will be unbearable. It has become very difficult for me to think positively and act accordingly as one day stretches into another. Rather than focus on lack of/problems I intend to see the New Year as a way of making changes to improve my quality of life. Have I recogised my Frustrations and how do I act on overcoming them? What are my Hopes and my Dreams? How do I go about reaching my Potential? This Post was to be on Boxing Day Traditions however, after working on it for two days, I have deleted my work. My heart is heavy and it is not coming together. My eldest son Damian, new wife Tyneal and Jascha were here for Christmas. Back in September when Damian made the decision to fly in on 22nd, giving me the opportunity to share in the celebration of Jaschas' 13th birthday, I was elated. We had been together for Jaschas' 10th birthday in 2007. It was the year after Jeremy's accident and we shared accommodation and visited the theme parks which are on the Gold Coast in Queensland. In spite of my broken heart we had a wonderful time, just as we always do when we are together. It has always been a family joke that I refer to Damian as 'My Damian.' The 'accepted' thing has been that Damian would be there for me in 'old' age should it be needed. He has regularly spoken about using it as a reason to get a home with a granny flat. Ha! Ha! When Damian and family flew out Boxing Day I could not help but think how true the saying 'Have a daughter, have her for life, have a son until he takes a wife' is. My beautiful Damian appears to have become intolerant of his Mother. I simply cannot believe it! Any thoughts that I may have had about moving closer have now been put to rest. I am in shock! I feel as if I have lost both my boys! So, on a brighter note, I wish to announce that the little wrens have returned to our garden. This picture is courtesy of the WWW. It is through my research as a blogger that I have learned that Boxing Day (St Stephen's Day) in Ireland is also also referred to as 'The Day of the Wren.' It seems to be symbolic that the little wrens (Malurus cyaneus) appear annually about this time and disappear towards the end of March. 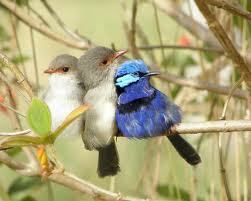 According to the Fact Sheet... 'Male Superb Fairy-wrens have been labelled as 'the least faithful birds in the world'. Females may be courted by up to 13 males in half an hour, and 76% of young are sired by males from outside the social group.' The wrens appear to be here to breed; I intend to enjoy both the sight and the sound of these little birds as they scurry along the ground looking for insects etc. We have a particular fascination with butterflies. Not only are they amazing pollinators, fun to watch and beautiful, but they instill in us a wonderful sense of transformation, hope, and life. The life of a butterfly is a journey of stages and rebirth and it reflects changes in our own lives. It is easy to understand why we would find inspiration from them. As I write this, I have a specific condition in mind: cancer. However, the metaphor extends to other physical conditions, as well as conditions of the mind, heart, and spirit. It extends to the difficulties of life, in general. We are always enduring and thriving. As we know, the butterfly begins its life story as an egg and from there it becomes a caterpillar. The most notable change is from caterpillar to chrysalis to butterfly. Now, I don’t know much about butterfly psychology—whether they anticipate their metamorphoses from caterpillar to butterfly, but they certainly do make it look easy. It is not an easy feat though. When the butterfly emerges, its wings are soft and folded. The process is usually bloody, or what appears to be a blood-like substance. Once out, their soft wings unfold and harden, at which time the butterfly takes to the sky to do their graceful aerial dance. Even then, the life of a butterfly is not easy; there are predators, parasites, and pesticides that threaten them. I don’t know if the butterfly knows its destiny, I don’t know if it looks forward to becoming a butterfly, but I believe that it is the journey that matters. A person close to me who is undergoing chemotherapy told me that when he sees a butterfly, he sees that it chose life. The butterfly’s journey is life affirming despite all obstacles. I cannot fathom the difficulties of undergoing treatment, living with, and surviving cancer. I cannot fathom the courage it takes to face something so scary. I won’t pretend to understand. The physical, mental, emotional, and spiritual toll it takes on the person living with cancer is enormous. It is transforming. The toll it takes on family is massive. In a time of so many scary changes and uncertainty we must look to hope, for which the butterfly is a classic symbol. I'm reminded of a quote, paraphrased: “But we rejoice in our sufferings because we know that trials build perseverance; perseverance, character; and character, hope. And hope does not disappoint us.” We can look to the butterfly for this. Jakob Cutter is a graduate of Indiana University with degrees in History and Psychology with a minor in Sociology. He is currently working as a butterfly farmer at Butterfly Dan’s in Kissimmee, Florida. Is the End Near? Or is it my Perception? It has become apparent of late that keeping a train of thought going long enough to do a Post is quite difficult. No excuses! It is just the way it is. There is so much I would like to do with these Posts and yet it simply does not 'come together' for me. Last weekend I purchased a new notebook computer, along with Dragon Naturally Speaking Voice Recognition Software, that will, hopefully, allow me to communicate with some ease. Laurice and Claire have a friend/worklmate that is going to help me with transferring files. I am excited at the prospect! My concerns have not changed of late; the fatigue being my greatest hurdle. I ask myself 'Is it the Femara, along with other medications, or is it the natural progression of the disease? I have the belief that we are often given some signs so it seems my patience will be tested as I 'play the waiting game.' This is not intended to be a unenthusiastic post about my life, it is simply my thoughts. These words are for my pleasure, your enjoyment and the benefit of future generations that have not 'known' me in my lifetime. The process of grief is multifaceted. According to Barbato and Irwin 1992 grief is fundamentally an emotional response to loss, the expression of which can include, sadness, sorrow, fatigue, depression, anger, guilt, anxiety. The list goes on! Although I feel that I have managed to avoid many of these symptoms it would seem that, intermingled with similar after-effects of Breast Cancer, I may not be the person I think I am . Much has been written about the effects of both grief and breast cancer/cancer on relationships. We know that many do not survive. I had considered myself to be one of the lucky ones. It is now 5 years since my surgery. I am just one year into my treatment with Femara; 4 to go! God willing! It is nothing short of a miracle that I am still here. Somewhere along the way it appears that I have lost myself. According to Haydn I have not recognised the loss. Although I consciously grieve for the many losses in my life, I had not been aware that I might also be grieving for the loss of self. Haydn is struggling with the person I have become while I would have said he did not even notice. He simply gets on with his life. I understand Haydn's frustrations. After all, he is my ex-husband; I know him well. We have been together 14 years. Although we separated, later divorcing, we have never been apart. I simply moved out, taking Jeremy with me. This I did to protect myself and my child. We continued to fraternise. I have noticed for some time that the relationship has become strained. I am used to Haydn and his need to retreat into his 'cave' at the appropriate times. It is his 'thinking' time. I was quite unprepared for the outcome this time. For the first time he laid his cards on the table with complete honesty. I appreciate that. Many things were said. It is not my intention to go into them here other than to say that it has given me plenty to think about. Haydn feels he is 'missing out' while I see him as 'living his dream.' He loves the farm. Being out in the paddocks, on his tractor, or with his cattle is what he loves to do. He has the freedom to hop in his vehicle and go wherever his heart takes him. His family are close by; he can see them whenever he chooses. There are things in our relationship Hayd finds difficult. At just 63 he has much to look forward to. With the 'right' partner, in good health, life could be good for him. On the other hand, I rely on him to take me to appointments. I miss out on so much rather than ask him to give up his time. I miss my family and my friends. I love my cyber friends who fill a HUGE void however, I miss personal contact. I feel the need to find my passion! I am no longer interested in 'housekeeping' and the fatigue prevents me from participating in many activities. It is interesting to note that Haydn does not share the same point view. I am grateful to him for his honesty and have explained that this is like a game of 'hot potato.' The 'hot potato' is in my hands and it is now up to me to decide what to do with it. My feelings are that this is something I need to 'hang onto' until the New Year, providing I don't get burnt. At the end of the day it takes two very special people to survive all that we have experienced in our lives. Simply put, maybe we are not the people we thought we were. I think I will have a look at the movie EAT PRAY LOVE. There may be something there for me. Oprah Down Under: Oprah meets with fans after her arrival at Hamilton Island on the Whitsundays. The visit has come at the cost of approximately five million dollars to the Australian taxpayers. It has been handled by Tourism Australia however, it is impossible to determine the benefits to our small, sometimes unknown, nation. It is hoped it will help to keep the wolf from the door with the Global Financial Crisis. Shaking off any jet lag, the guests, all prize-winners, will feature in the audience during two shows to be taped in Sydney; renamed Oprahville for the occasion. Are we O-verdoing it with the Sydney Opera House to be re-named Oprah House while the Harbour Bridge is to display a big O in her honour? After settling into Sydney's Intercontinental Hotel the excitable tourists were expected to be split into small groups to be sent on short stays across the country. Sources of Winfrey's production company Harpo have confirmed that she will make her only official public appearance in Melbourne on Friday. A civic reception at Federation Square will give Prime Minister Julia Gillard a chance to share Oprah's spotlight. She will also make a guest appearance at the taping of The Oprah Show. NSW Premier Kristina Keneally will host an official welcome reception at Sydney's Royal Botanic Gardens on Saturday night. Is there such a thing as 'something' for 'nothing?' My answer to that would have to be 'yes,' and 'no. '﻿ Maybe I am a little confused! I have always said that 'nothing' is 'free' and yet it seems I receive 'plenty' just doing what I love. Writing my Blog gives me such pure joy that I am in touch with these feelings knowing that my Followers are growing in number. In the process I am left with Comments that gladden my heart, providing love, wisdom and so much more. I continue to meet the most amazing people to whom I am very grateful. I am also grateful to my doctor and my dentist. My dentist advised me of an Australian Government programme providing dental treatment to patients living with chronic medical conditions, and complex care needs as verified by a General Medical Practitioner. I approached my doctor who duly ticked all the boxes and decided that I was indeed eligible for the programme providing AU$4,250 over two years. Although I am no longer a taxpayer, I have paid taxes all my working life. Maybe this is what Karma is all about? Given that the condition of my teeth, and gums, are deteriorating as a result of medications taken to prolong my life it is imperative that I receive regular check-ups. It was at my scheduled appointment yesterday that I discovered there was a glitch in the system and my application had not been processed. On learning this Dr Amna Khan, my dentist, advised me there would be NO CHARGE for yesterday's consultation. Not only is she a wonderful dentist she is a superb human being. Thanks also to my wonderful Case Manager Trish. I was excited at the prospect of having a Scribe for 4 hours. She was due here this morning at 10.30am to do my Christmas Cards. I waited in anticipation, knowing there are friends with whom I have had no contact this past 12 months. A Christmas message lets them know I am still around. This is another funded service; maybe it's a case of 'good help is hard to find.' Apparently the Scribe claimed she could not find our place; rather than contact her employer for further instructions, she left the area. and answer in extraordinary ways. I awoke in recovery at approximately 5pm, after nearly 4 hours of surgery. Dr Crea explained that there was an unusually high number of blood vessels to be tied off. We are fortunate to have insurance to cover the costs associated with a stay in a private hospital. What that insurance does not guarantee however, is an appropriate rooming companion. All I remember of that first night in a shared room was a constant stream of doctors, nurses and a very vocal patient; my 'companiopn,' having undergone major back surgery, was in in pain! It was 'painfully' obvious that alternative arrangements should have been made for one of us! Somehow, we both survived that first long, painful night. Night two I did my usual 'early to bed' in anticipation of sleeping soundly. It was not to be! At 9pm my inconsiderate companion decided it was time to make her very personal phone calls. The clock ticked slowly and the phone calls seemed to go on... and on... and on. The following morning I suggested to her that the arrangements were not working for me and it was my intention to approach the nursing staff in order to ask about relocating. My room mate was appalled and suggested I do nothing; she would make every effort to be mindful of her actions in future. My five day stay in hospital went well from then on. It surprised me to find the food was good. I was able to 'slip' (not literally) downstairs to have my hair shampooed and dried. The coffee shop allowed me to 'grab' a coffee to be enjoyed in the sunshine. Life was good - the future looked bright! May your birthday be filled with yesterday's memories, today's joys and tomorrow's dreams Ness. Last year I purchased this Angel Wings Lotus plant on Jeremy's birthday. It was not doing well in a pot on the Al Fresco area; I suggested to Haydn that we put it in the dam. The spot was chosen because it was easily accessible. We then found that it had completely disappeared and we were unable to find even the pot. 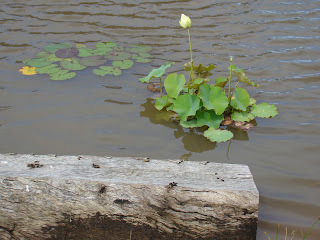 That was until Spring arrived and the lotus gave birth to new leaves once again! We waited patiently for the lotus to bloom for Jeremy's birthday on 16th November and then again for his Angel Date 21st. We wondered why it was taking its time. What better time than today to celebrate Ness' Birthday. Unfortunately 50ml of rain over the past 24 hours meant taking this picture from afar. I was concerned enough for my own safety that I retreated, camera in hand, when I began to slip and slide down the bank towards the dam. I first met Ness when I arrived in Bairnsdale in November 2006 to organise Jeremy's Celebration of Life Service. It was there I met this most delightful young woman. Jezz had been telling me about her for weeks. Vanessa's Mum told me that her daughter had been given a new lease on life thanks to my son. Jezz was always capable of giving 'new life' to everything he touched. It broke my heart to later learn that Ness had been diagnosed with breast cancer. I often reflect on the accident, and the diagnosis, and wonder about the correlation between the two. As a 33 year old Ness endured surgery, chemotherapy and radiation followed by reconstruction in August this year. Although the details may not be 'perfect,' there are a couple of things that stand out for both of us. 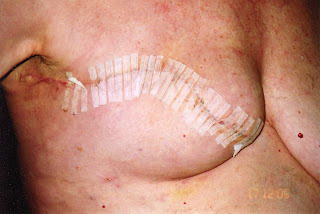 The first was the Sentinel Node Biopsy which led the surgeon to nodes deep within the chest wall that were cancerous. Her surgeon even suggested she had angels on her side; she just smiled. Apparently the circumstances were most unusual. A first for him! He said had it not shown up like that he would never have known to remove those nodes and who knows what the outcome may have been. Because of the extent of the surgery Ness was in extreme pain and then had a serious reaction to the morphine being administered. I later received a message from her taken while undergoing radiation. She said 'Can you believe it? The roof is covered with butterflies. He's always around when I need him.' Maybe it helps that Vanessa means butterfly! Vanessa is now engaged to be married and has put her treatment, and her disease, behind her. Ness, you will always hold a special place in my heart sweetie; Jezz and I wish you the very best for your future happiness.